"Modern style, Comfortable, Fully furnish and Serviced…KARON SUTDIO Apartment." 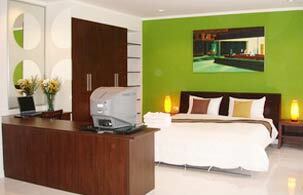 A new Design Studio Apartment in Karon Beach with nice and quiet area for living. Providing you with full comfort in room with WIFI internet, safety box, kitchen, large fridge, cable TV, DVD player , Air-conditioned, Hairdryer, maid service. Rooms (26 - 46Sqm), Providing you with four rooms types with Standard, Deluxe, Premier and Studio room which have more space than a normal hotel room. You will be staying as comfortable as your own private apartment because there are only 12 rooms available.